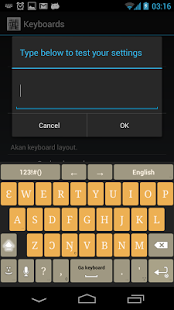 kasahorow Keyboards for Android lets you type in Akan, English, Gbe, Ga-Dangme, Hausa and Yoruba conveniently. Use it as a normal keyboard by simply installing and selecting when you want to type an African language on any Android devices you have. Download it from Google Play and the Amazon App Store. Express your thoughts and feelings in any of the supported languages. Brought to you by kasahorow.